I want to share my labor story for a few reasons. The first reason is for me. 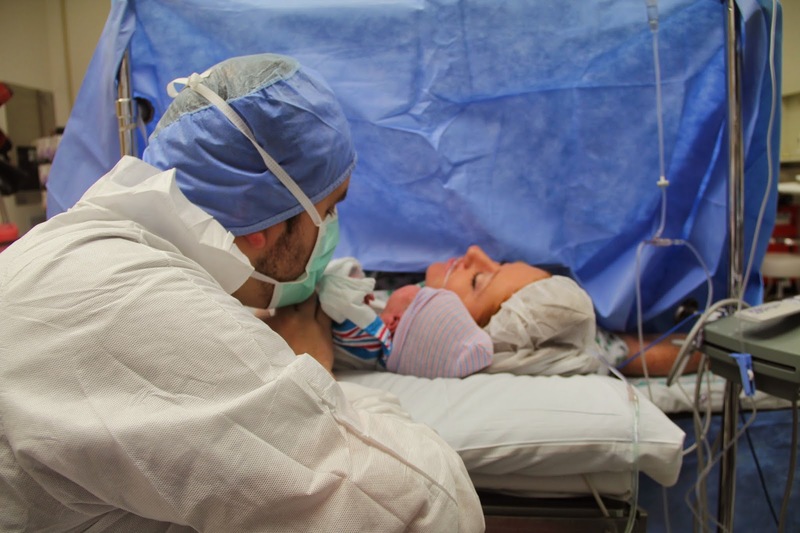 I want to never forget the day, and all the emotions that went with bringing our first daughter into the world. The second reason is for you. As I neared the end of my pregnancy, I read every labor story I could get my hands on in hopes to better prepare myself for what was about to happen. In a sense I became obsessed. I was terrified of what was about to happen. As much as I was prepared to have a baby on the outside, the idea of how she was going to come into this world was a whole new level of anxiety. Let's begin shall we? WARNING: Super long post! As you all know, I was done being pregnant at 37 weeks. I had convinced myself that I was going early and sometime before the New Year we would be announcing the birth of our little girl. I couldn't have been more wrong. Week after week, I would go to my doctor's appointments only to find that I wasn't progressing. I was 1cm dilated and 50% effaced for 3 weeks. After every appointment I would come home and just feel sorry for myself. I wanted nothing more than to have this baby. I kept thinking I was having contractions, but in reality I didn't know what to look for. 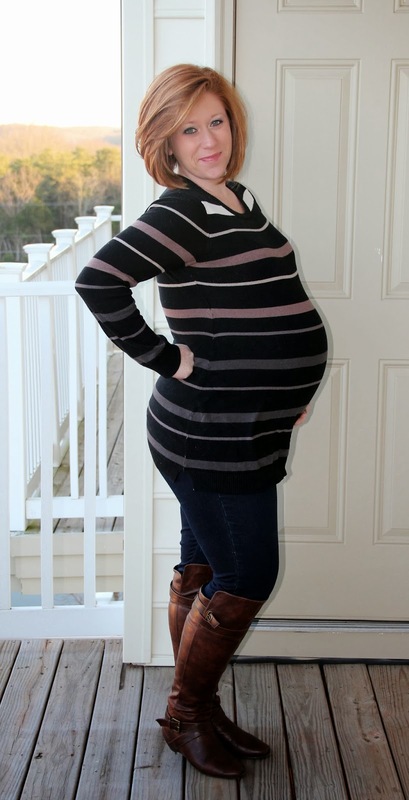 What I was feeling was a lot of Braxton Hicks contractions because they never were consistent or really painful. At my 40 week appointment, I was told to come back early the next week and have an ultrasound to determine how big this baby was going to be and to come up with a game plan. FINALLY, there was an end in site. It was Friday, and I just needed to get myself to Wednesday, January 8th (4 days past my due date). The only appointment available was at 4pm so of course the day just dragged. I finally got my ultrasound and the tech told me that her estimate of Charlotte's weight was 9lbs 4oz! (Now I know these measurements aren't accurate so in my head I was telling myself there is no way this baby could be that big, she is probably no more than 8lbs.) How was I going to birth a baby that big? The doctor came in to check me and see if I had progressed any further. Nope...still sitting at 1cm dilated. SERIOUSLY, it's been nearly 4 weeks! I could tell he was fighting an internal battle on what to do with me. The logical next step would be to induce labor and hope that my body would naturally progress. However, this doctor knew that with a baby potentially this size and the fact that my body was nowhere close to being ready for labor, he gave me the choice. I could go in and be induced and see how far I would get, but he figured I had at least a 60% chance of everything ending in a C-section. The second choice was to go straight for the C-sections. He was very hesitant on this options because I was a first time mom with no complications other than a potentially large baby. I talked it out with him and said that the odds didn't seem to be in my favor and why would I want to recover from essentially two labors? He agreed, and took me to the receptionist to schedule my C-section for tomorrow morning as long as there would be openings. Wait, tomorrow?! That's it? Just like that I had picked the birthday of our daughter and my husband wasn't even there! Is this really happening? 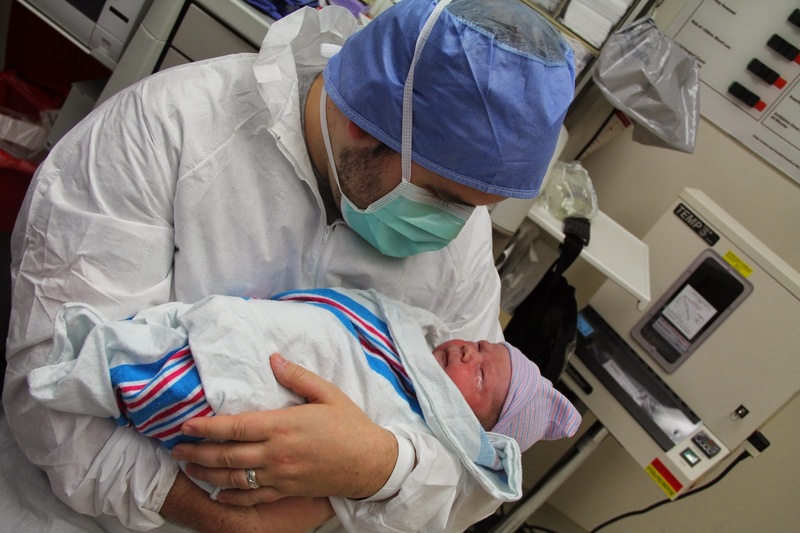 I hadn't even begun to prepare for what a C-section would be like. Sitting there, waiting for the hospital to confirm my time, I called my husband to let him know what was about to happen. In less than 24 hours we would be holding our little girl. It was so final. We both were ready, but never imagined it would be like this. Scheduled, no drama. I got in my car and immediately started crying. On one hand I was so happy that after 9 months, I was going to finally meet our little girl, but on the other, I was terrified. I have never had surgery and have a fear of needles. How was I going to do this? I always figured I would be in enough pain by the time I got to the hospital that I wouldn't even notice the epidural. Now they want me to come in like a regular doctor's appointment and poke and prod me when I'm in no discomfort to begin with. I called my family to let them know what was happening and then just drove home in a daze. Once I got home, we decided to go out to dinner with my parents to take my mind off of tomorrow. I called one of my friends who had a baby a year ago via C-section at the same hospital and she stepped me through everything that would happen. This definitely helped and made me feel more prepared. Morning of January 9th: I woke up and showered and got ready like any other day (except for the crazy butterflies in my stomach). I did my hair and makeup since I had no idea when I would get the chance to shower next plus I knew there would be tons of pictures. My father-in-law drove up from Richmond and met us at our house where my husband, myself, my mom and father-in-law all drove to the hospital. It was just like checking into a hotel. We had our bags and were told to wait for a nurse to come and get us. After a few minutes we were taken back to a labor room to prep me for surgery. Normally you get taken back to a big room with just curtains, but since that room was filled, we got our own private labor room to set up in. Once the IV was in and blood work done, they said my mom and father-in-law could come back one last time since we had the private room. 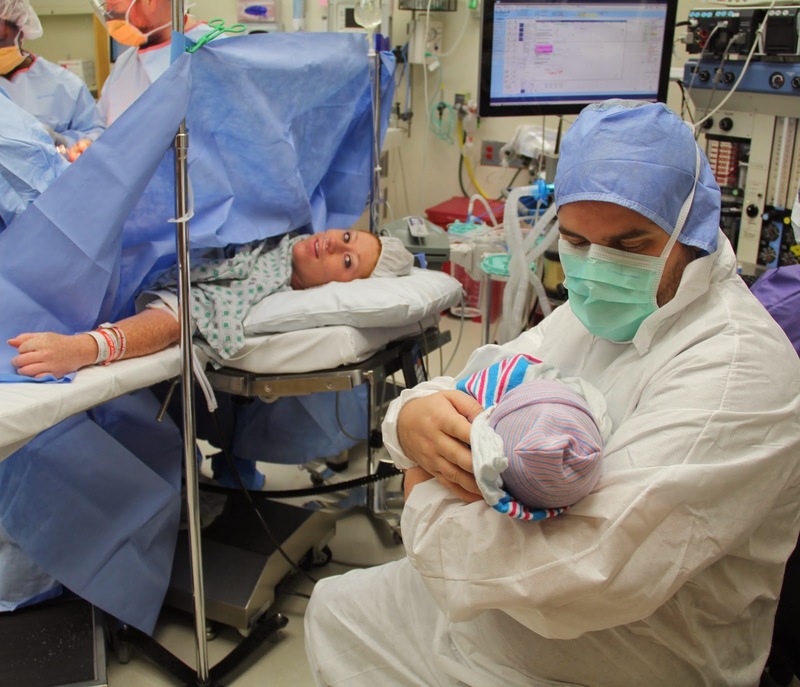 We all made small talk and before I knew it the anesthesiologist came in to step me through the epidural. She did a great job explaining everything and making me feel at ease. She really stressed communication through the whole surgery. Now it was time to head into the operating room. I was scheduled for 10:30am but they were running a little behind so we didn't get in there until 11:15am. They made my husband wait outside all suited and ready to go until the epidural was in. I just remember walking into that cold operating room and everything seemed so final. My heart was pounding but I knew in just a few minutes it would all be ok. I was quite surprised how well I did with the epidural. The numbing needle is the only one I felt and it was just a quick burn, or bee sting as the anesthesiologist called it. Once that was done, they did the big needle and all I felt was pressure, no pain. Suddenly a warm feeling came over the lower half of my body and everything went numb. Not scary numb, comfortably numb. Next thing I knew, my husband came in and sat right next to me and held my hand the whole time. We were under way and I finally felt excitement and not fear for the first time in nearly 24 hours. I was about to meet our little girl! My blood pressure kept dropping (totally normal) and I would just tell the anesthesiologist that I was feeling light headed or nauseous and she would push medicine through my IV and I was back on cloud 9 within seconds! Finally, at 11:52am I heard the doctor say, "Looks like we might have a 10 pounder!" All I wanted was to hear her cry. He told me they were still getting her out and that I would hear her in just a minute. the second that baby cried, a flood of emotions just came over me. That was it! She was here! I was prepared that I wouldn't see her right away but just kept talking and listening to the doctor and nurses to find out how much she really weighed. They finally gave me her weight, 9lbs 12oz. Thank God I didn't try to get induced first! My husband went over to take pictures and to meet her while they stitched me up. I kept peeking over to my side to get a glimpse of her. It wasn't long before they brought her over to me. It was so wonderful! I just wish I could have held her. After Charlotte and my husband left, the doctor came over to tell me that he was so happy with the decision we made. 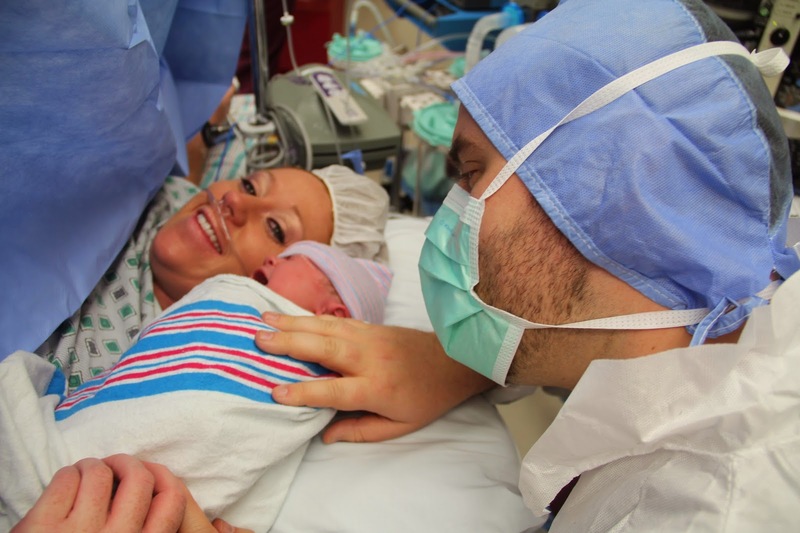 He said my body was nowhere near ready for labor and that with her size, there would have been a lot of complications had we gone down the induction path. Recovery: Now with all the excitement over, I was wheeled into recovery where my husband and Charlotte were waiting for me. Unfortunately this is where things get a little harder. I had a bad case of the shakes from the anesthesia (which is pretty common) so I couldn't hold her right away. Then my blood pressure and body temperature kept dropping. I remember at one point just feeling soaking wet and then being told that I needed warm blankets. It was torture. I kept telling them, I was hot and begged them to take them off, but they couldn't since my body temperature dropped to 96 degrees. Usually you are in recovery for a few hours, but I ended up being there for over 3. My family waited and finally everything was under control and they took me to my room. Not even 5 minutes later everyone was there ready to meet Charlotte. I was still struggling to come out of everything, so I don't remember much until about 6pm that night. That was the first time I actually got to hold her. By the time everyone had left for the night, I was starting to feel a million times better. I got up that night to walk around since I was told that makes a huge difference with your recovery. By the next morning I got unhooked from everything and was able to shower and get dressed. I finally felt human again! I was still sore, but the medicine kept the pain tolerable and before I knew it, it was Sunday and time to leave! We have now been at home for over a week and everyone is adjusting quite well. I can't complain about sleep because she sleeps for 3-4 hour stretches, I feed her and then she's back out until the next feeding. 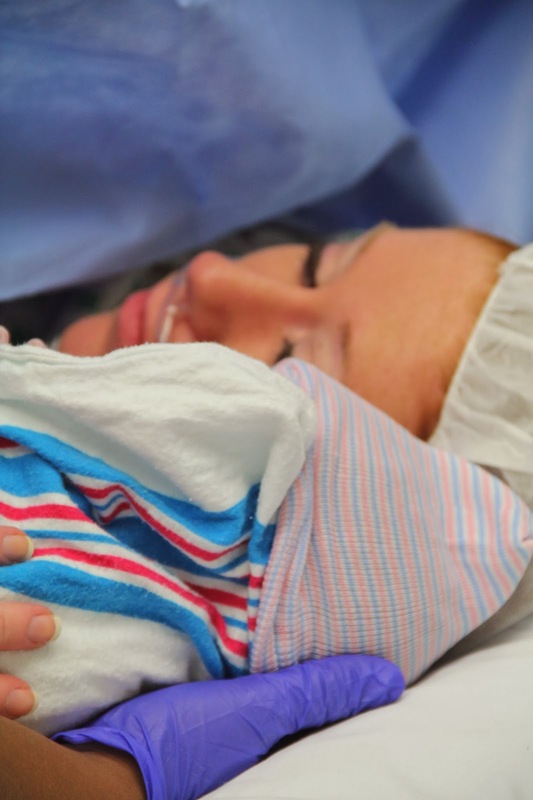 Sorry for the long post, but I hope this will help someone through their first C-section like so many other bloggers helped me with their stories. The time has FINALLY come! 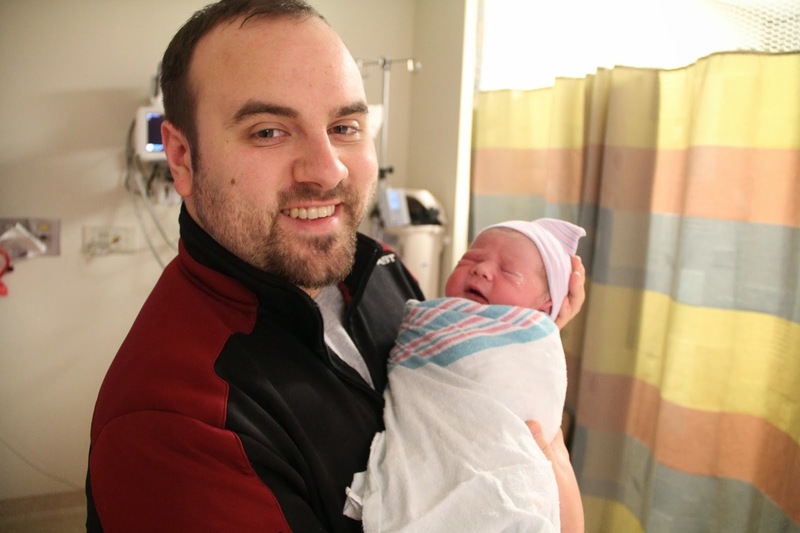 We are pleased to announce the birth of our little girl, Charlotte Noel. 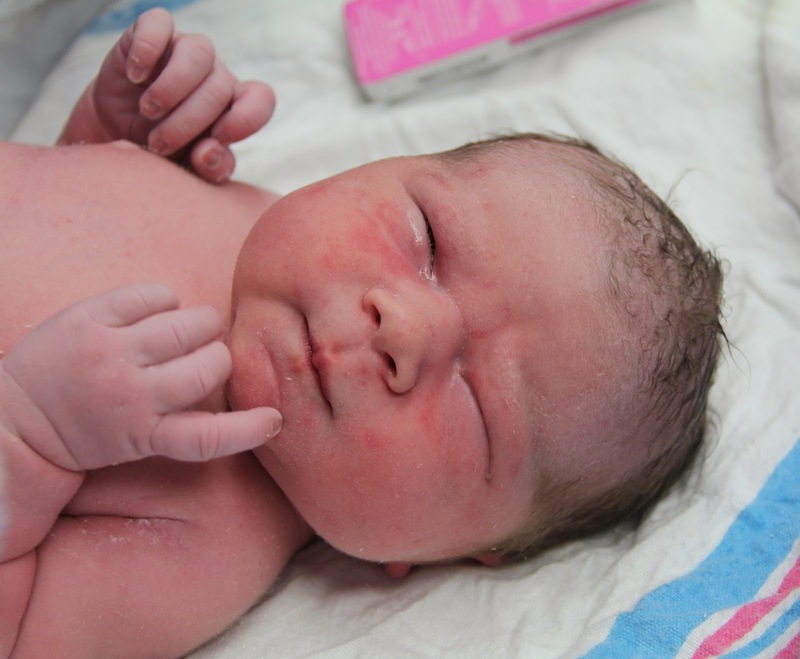 She was born yesterday, January 9th at 11:52am via scheduled c-section, weighing in at a whopping 9lbs 12oz! 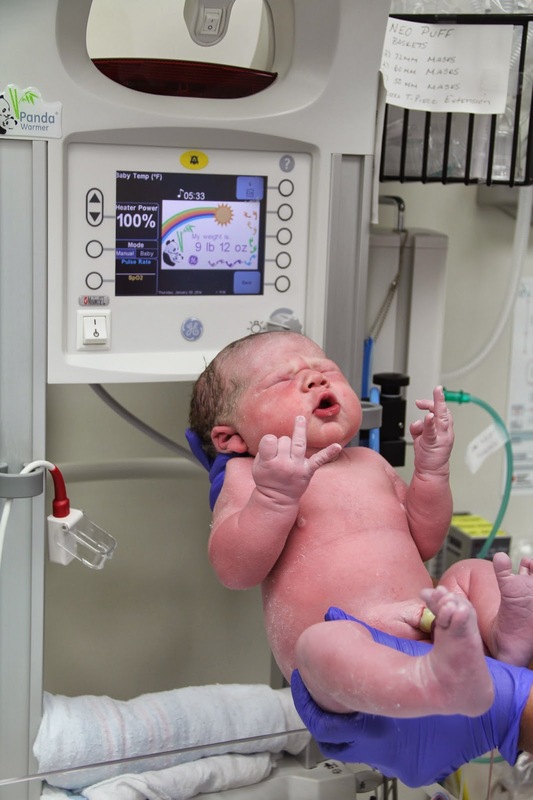 I am so happy the doctors decided to go c-section at the last minute. Everyone is doing well and we couldn't be more thrilled with our little not so little bundle of joy. She is the only high five that matters for this week! This has been one of those projects that I've been putting off for months now. It truly is the last project for the nursery, but I couldn't quite figure out how to execute it. 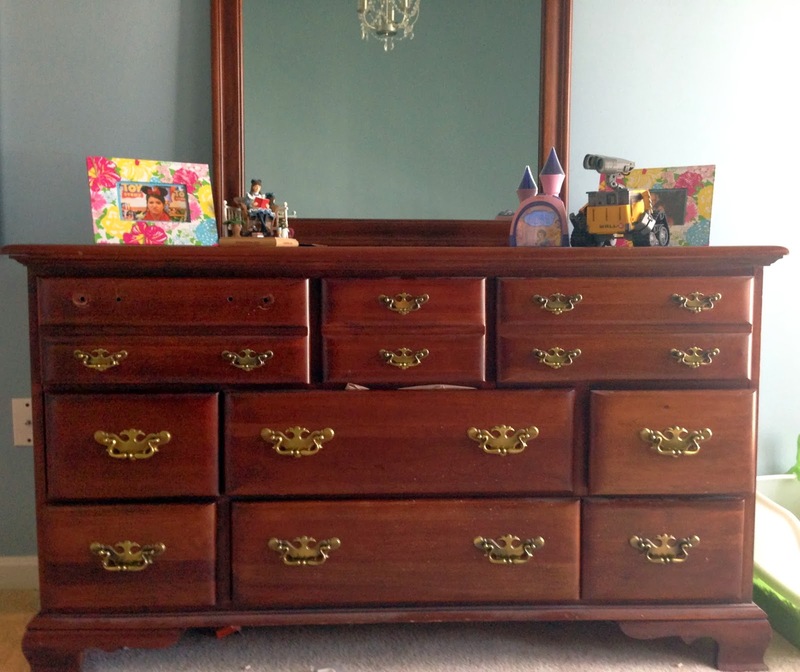 We go this dresser from my in-laws and it happens to match the crib quite well, so painting it was definitely out of the question. It needed a little update though so I thought, "How hard could redoing the drawer pulls be?" The hardest part was coming up an idea that would actually work. First and foremost, measure! Know what you're working with. I figured my current drawer pulls were standard so off to my local hardware store to get some cheap pulls in two different sizes, one for the top and one for the bottom. I immediately started wrapping the smaller of the two in my Lilly fabric and instantly fell in love. Now to put them on the dresser.....womp womp....they don't fit! Ok maybe they'll fit the other size. Nope. Turns out I needed 2.5 inch and 3.5 inch and I had 3 inch and 4 inch. Long story short, this was not going to work! Maybe we can spray paint these bad boys and give it a shabby chic look. The spray paint didn't stick well to the tarnished metal and even after some cleaning, it still wasn't giving me my desired look. What to do? It was time to forget about the project for a little while. Fast forward to an overdue pregnant lady trying to occupy her time with something other than counting Braxton hicks contractions and attempting to will myself into labor. It was time to DIY again! The easy solution for these drawer pulls was to buy some cheap wooden knobs and cover them in my leftover fabric from the rest of the nursery projects. But therein lies another problem; each drawer pull has two holes which means I would need two knobs to cover the place of one pull. Would this look dumb? Lucky for me, I found someone on Pinterest who was clearly in the same dilemma as me and made it work. It's whimsical, I told myself. Maybe it will be good for Charlotte and help her practice her fine motor skills. I really was running out of options and out of time. The decision was made, I was going to make 36 fabric covered drawer knobs and I was going to love it! Now that you know that back story, let's get started on this super easy (but time consuming) tutorial. Take your paintbrush and cover the wooden knob with Mod Podge. Then simply place your fabric square over the knob and begin smoothing and wrapping. Once you have it on there the way you want, take your rubber band or hair tie and secure it at the base. This will hold everything in place while it dries. Wait for it to dry then trim off the excess fabric and Mod Podge the bottom. This doesn't have to be perfect as you won't see it once it's on the dresser. Now you can remove your rubber band and coat the entire knob with Mod Podge. This will give it a little shine and make it more durable. I also think it gives a nice finished and polished look. And there you have it! All done! Now just arrange them the way you want and install on your dresser. Easy as that! So what do you think? Did that help our slightly out of date dresser and make it little more kid friendly? I think so! Well, January 4th has officially come and gone and we still have no baby. It's really starting to mess with my head. I know it's physically impossible to be pregnant forever, but sometimes I feel like she's never going to come! 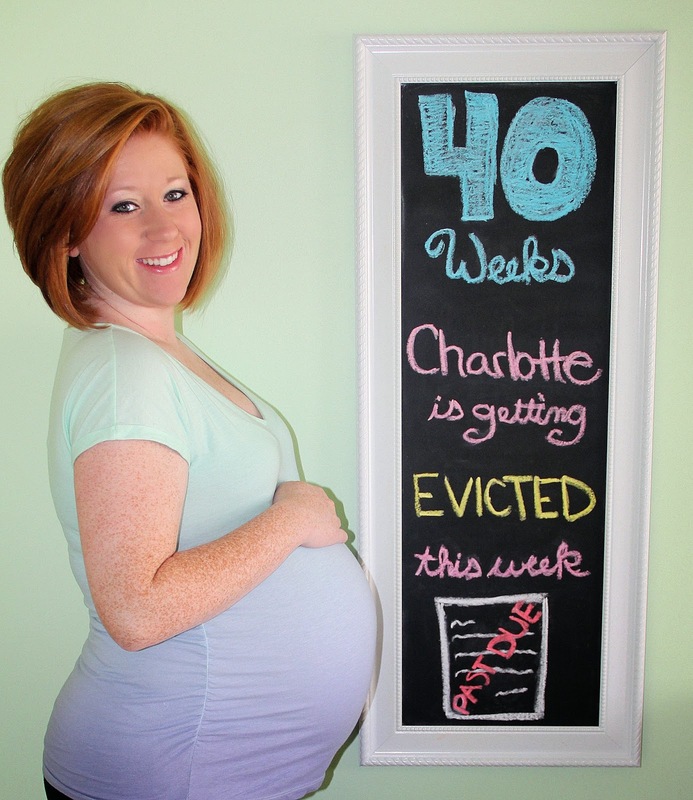 I have not been progressing at my weekly appointments, so most likely I will be induced at the end of this week. I can't stand the thought of being pregnant for another week, so even though it's not ideal, I'm fine with not going into labor naturally. I thought I would be happy to know that there is an end in sight, but I still find myself wishing today would be the day. The Bump: Just when I think it can't get any bigger, it does. 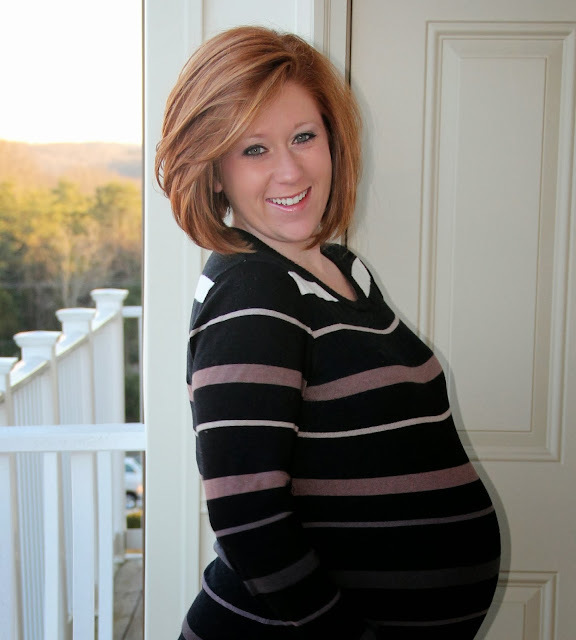 Symptoms: Typical end of pregnancy symptoms: tired, numbness, back aches, etc. Food Cravings: Still craving ice like it's my job. Sleep: I'm still not getting good sleep, but it's enough to get me through the day. The things keeping me from sleeping are numbness, not being able to sleep on my side and getting up 3 times a night to go to the bathroom. What I miss: Being active! Right now every task is physically draining. Just going downstairs to get water leaves me short of breath. Hard to believe that I used to run long distances! Movement: She has really slowed down. A few times a day she throws a dance party, but other than that I think she is saving her energy for the real world. 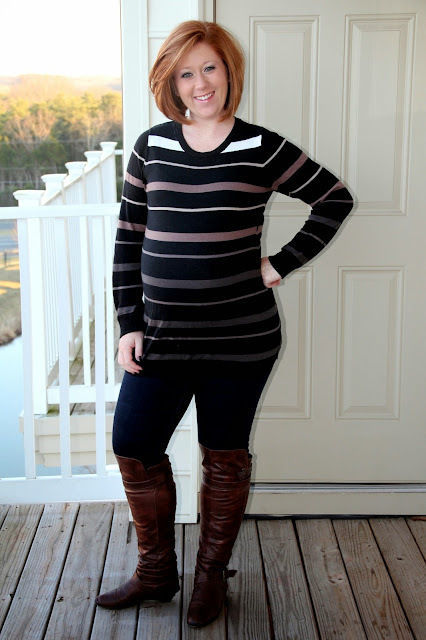 Maternity Clothes: Nothing like wearing the same 3 things everyday. The good news is, I pretty much stay inside so no one sees me. Labor Signs: Been having contractions but nothing regular so I can only assume they are Braxton Hicks. Best Moment of the Week: Spending quality time with my husband before our entire world turns upside down! What I’m excited about/looking forward to: I have an appointment on Wednesday to check her size and schedule an induction! First and foremost, I hope everyone had a GREAT New Years Eve last night and are excited for what 2014 brings! We kept it low key and treated it just like any other night. As much as I would have liked to do something special for our last NYE without kids, I just wanted to relax and enjoy these last few quiet moments before baby. 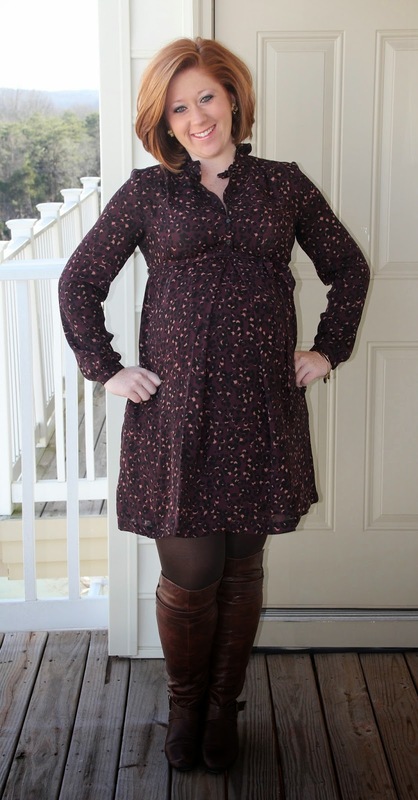 This outfit post wasn't my favorite, but I think being 4 days away from my due date might have a little something to do with it. I'm officially to the point where I just want my body back. Maternity clothes don't even fit and I feel like everything is swollen. So why even do this post? Well, the truth is, I don't want to pretend. I want to look back at these posts and see that there were days where pregnancy was exciting and fun and then days where getting out of bed and showering was a huge feat. So here is an outfit that I wear about every other day now, as it seems to be one of the few things that still fits my freakishly large ever expanding body.